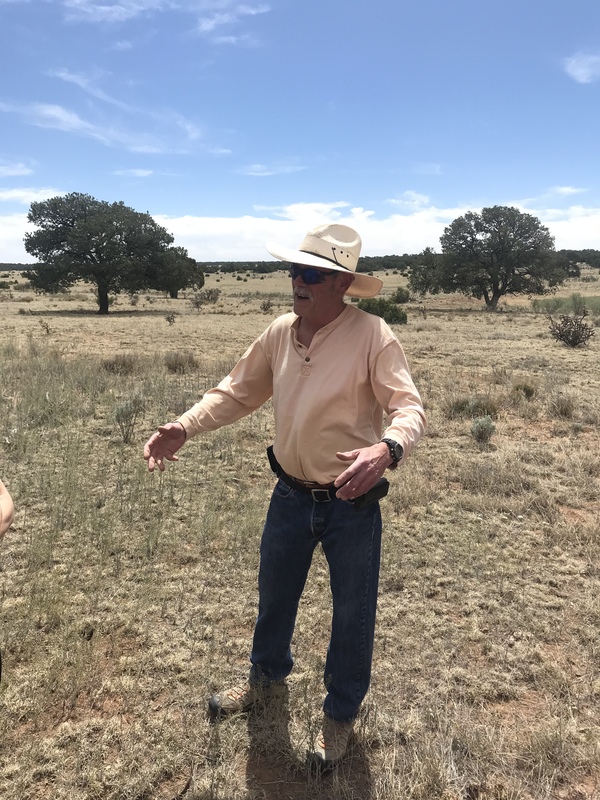 Long time visitors to this blog have read about the Shadow Horse Gang, a pack of desperadoes that roamed northern New Mexico. The gang was legendary but has dwindled in recent years. Trader Dave tired of the trail and disappeared into the hills of Tennessee. 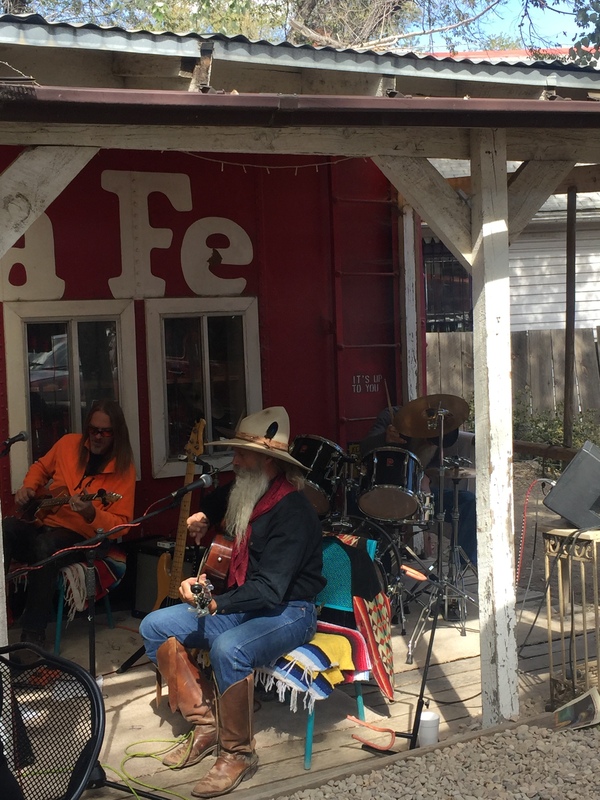 Doc Pete settled down in Santa Fe but can still be enticed into the occasional adventure. However, Shadow Horse, the legendary leader of the gang, has not given up his life of outlawry. He is rarely seen, but, last month, there were several sightings of Shadow Horse. It made people wonder. Were there patterns in his movements? Is he building a new gang? 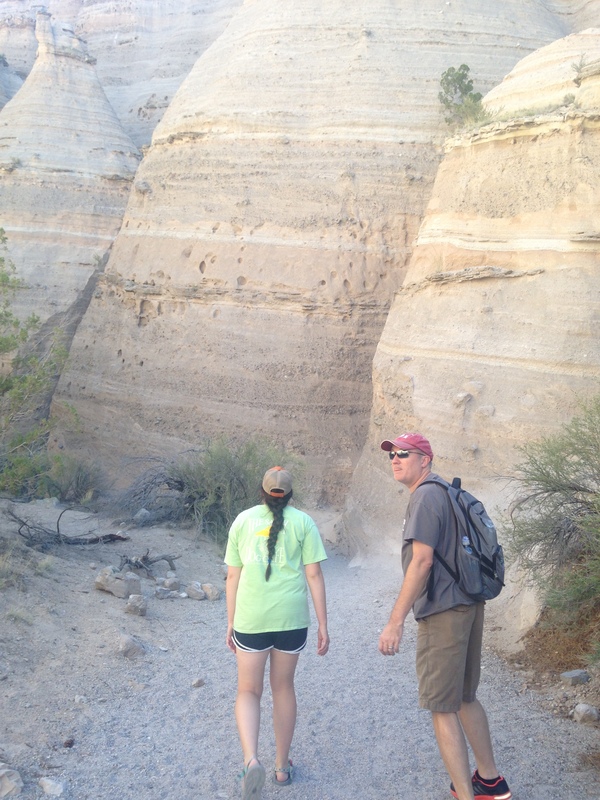 One of the first sightings of Shadow Horse was at the end of the Tent Rocks Trail. 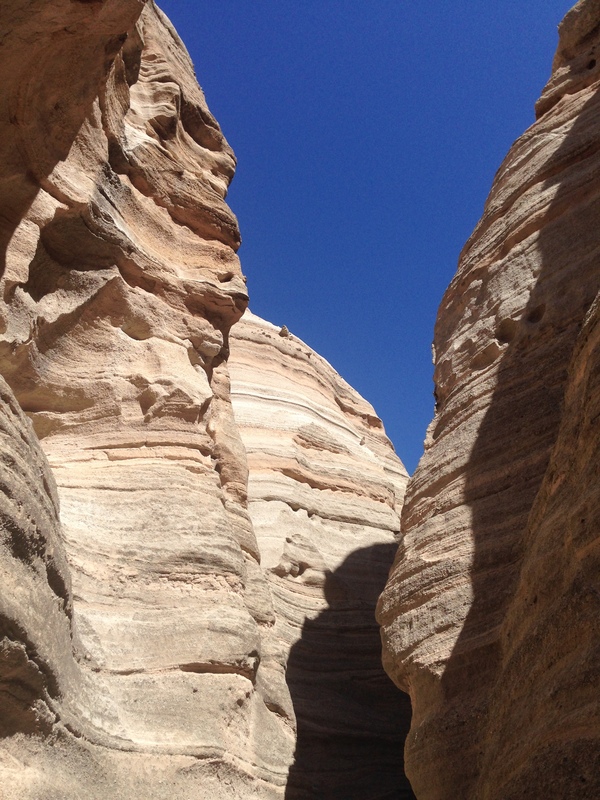 After making his way through the slot canyon, he performed the Medicine Wheel ceremony. Using the knowledge of his Indian heritage, Shadow Horse called upon the spirits to protect those who were traveling with him. 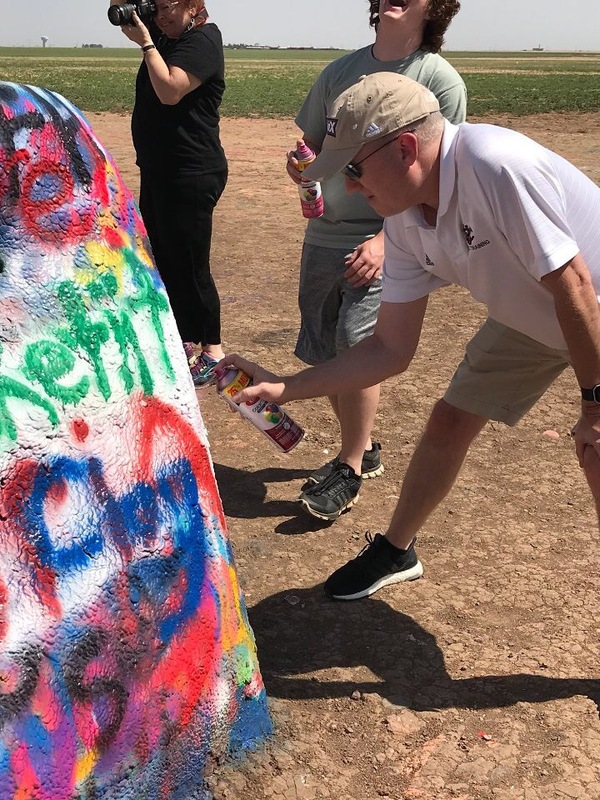 Next, he was spotted in the vast reaches of Chaco Canyon, home of the Ancient Ones and the perfect hideout for a gang of outlaws. 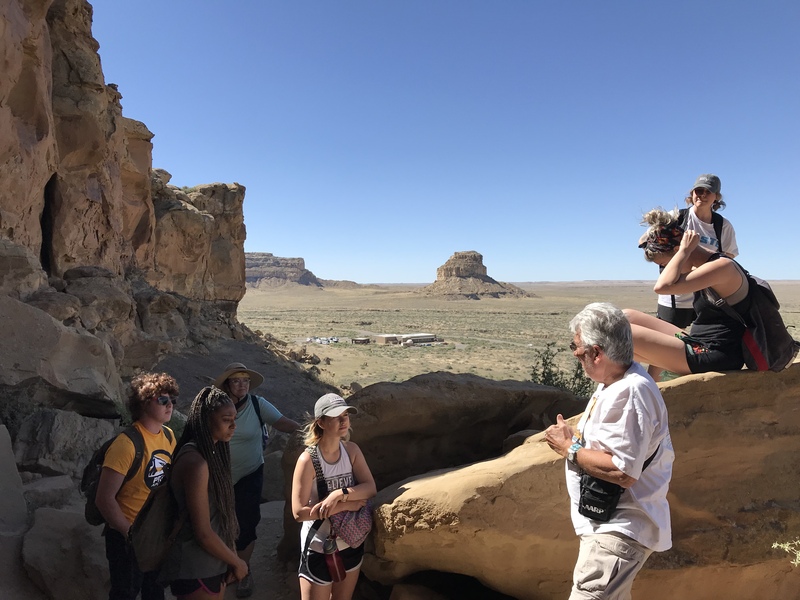 It was in Chaco Canyon that Shadow Horse was seen conversing with others who had made their way to that distant locale. Was he trying to recruit them? Shadow Horse is afraid of no man, but, at Acoma, he ran into conditions that were almost unbearable. It was raining, and high school kids were everywhere. As I wrote, Shadow Horse is afraid of no man, but rain and kids make him extremely uncomfortable. For years, Frijoles Canyon has been a place of refuge for the Shadow Horse Gang. Old habits die hard. Almost as hard as old outlaws. Visitors saw someone who looked like Shadow Horse in one of his favorites haunts. They did not want to get close, but they swear that it was him. Shadow Horse may have thought they were too close. 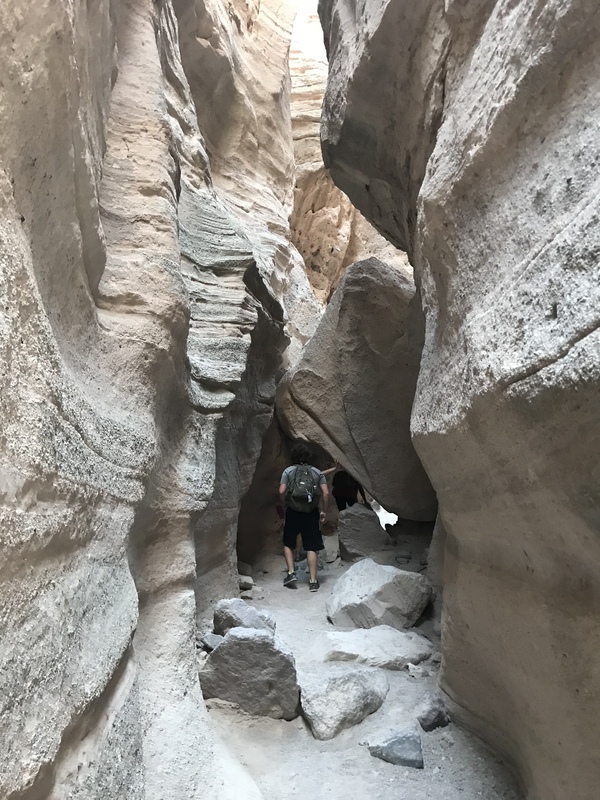 It was not long before he fled the canyon and made his way to Tsankawi, a side trail that only he and a few others would know about. The last appearance of Shadow Horse was at Pecos. 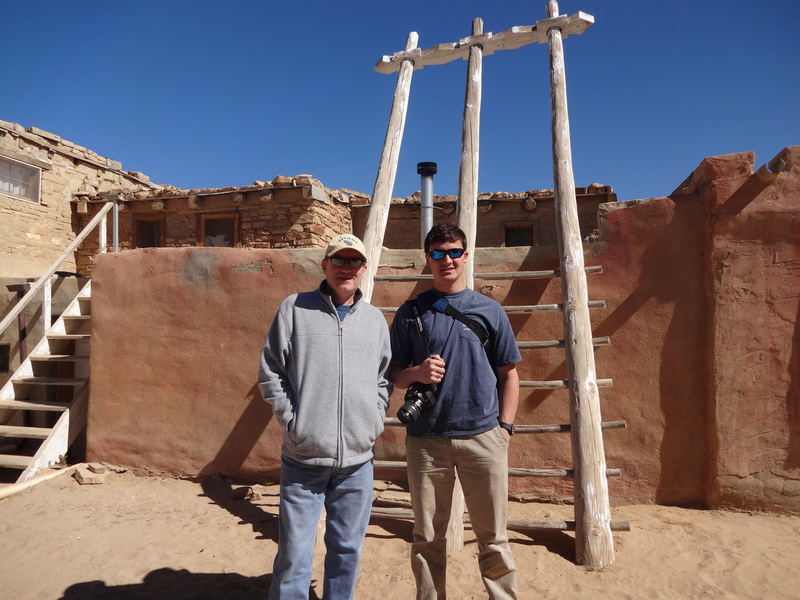 He made his way through the Pueblo ruins along the old Santa Fe Trail. Shadow Horse was not seen again. Some say he left northern New Mexico under the darkness of early morning. Others say he remains in the area and is trying to rebuild his gang. The certainty is that he will make an appearance next spring. Doc Pete might be riding by his side. The Kid might be leading the way. All I know is that the good people of northern New Mexico need to stay on the lookout for the return of Shadow Horse and the reemergence of the Shadow Horse Gang. 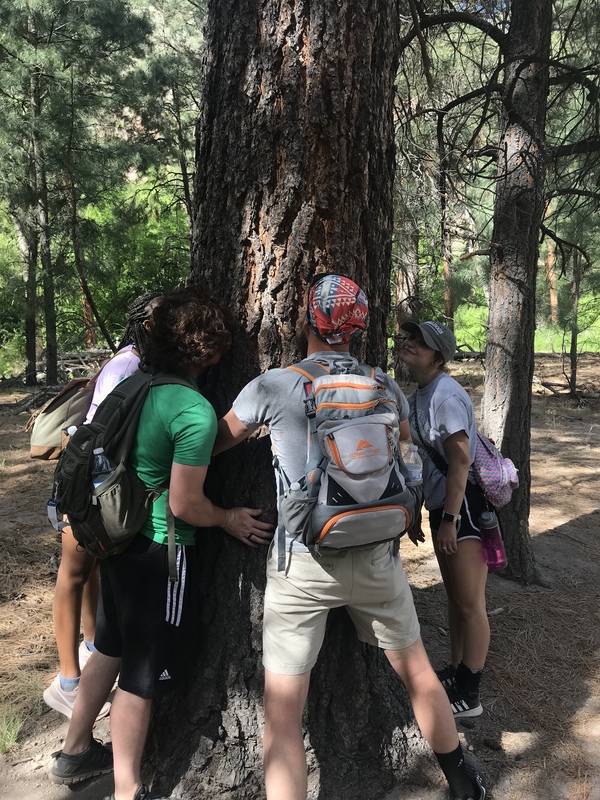 My wife and I just returned from a trip to Santa Fe, New Mexico, and it was fun to experience with her the things I usually experience with students. 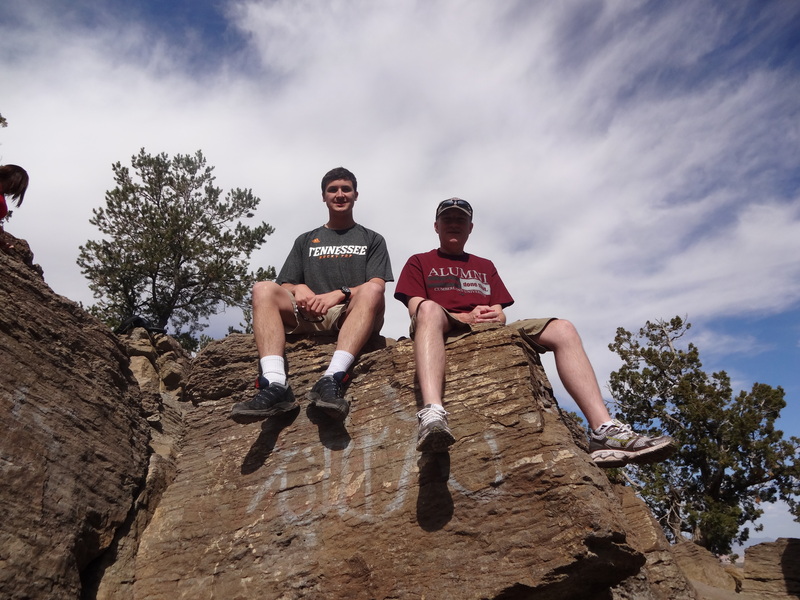 It was also fun to visit Santa Fe in a more relaxing way. We hit a bunch of the cool spots that I have written about before. We also ate at some fantastic restaurants. Along the way, we found time to go to an awesome movie theater, and my wife spent some time in the spa at our hotel, the Inn at Loretto. We also visited a former member of the Shadow Horse Gang. Oh yeah, we also bought a piece of Native American art that dates back a couple of thousand years. It was a great trip, and I am glad that my wife and I spent some time in one of my favorite places. 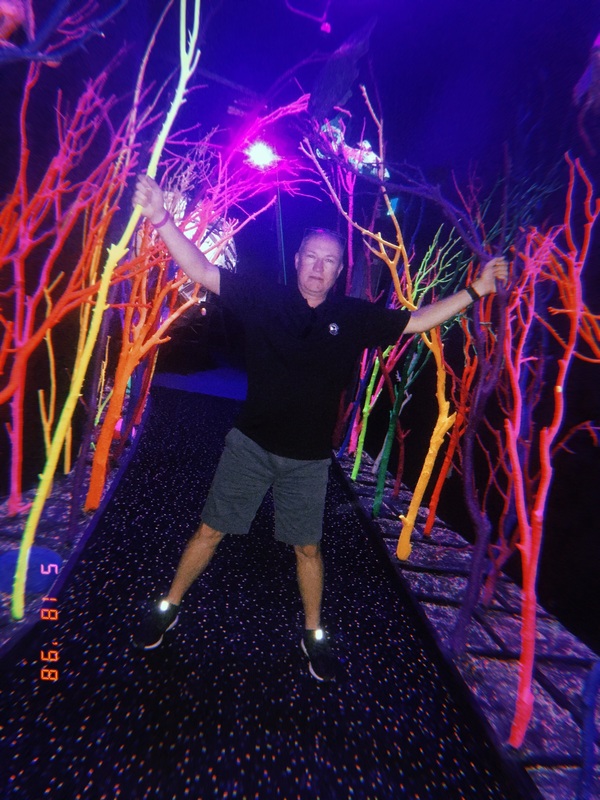 Two people driving around in a regular vehicle allowed us to do some things that are not possible with a bunch of students in a 15 passenger van, and a couple of those things led me to some deep thinking. On Saturday, we made our way to Madrid, an abandoned mining town that became home to some people who wanted to get away from the bonds of society. I have been there many times, but this time was different in one respect. We got to sit and have a beer. While drinking that beer, we listened to a band called Cactus Slim and the Goat Heads. As we listened, I realized that the band was made up of locals who had, as I wrote earlier, made their way to Madrid to find freedom from the stresses of our world. One table was filled with other locals who had done the same thing. The table in front of us was filled with people who looked for freedom in another way. There were two couples who had ridden their motorcycles to town. Madrid has become a destination for those weekend riders who want to spend Saturdays and Sundays on the roads with the wind in their hair. After all, helmets are not required in New Mexico. Listening to the music and watching the people made me think about the larger city down the road. 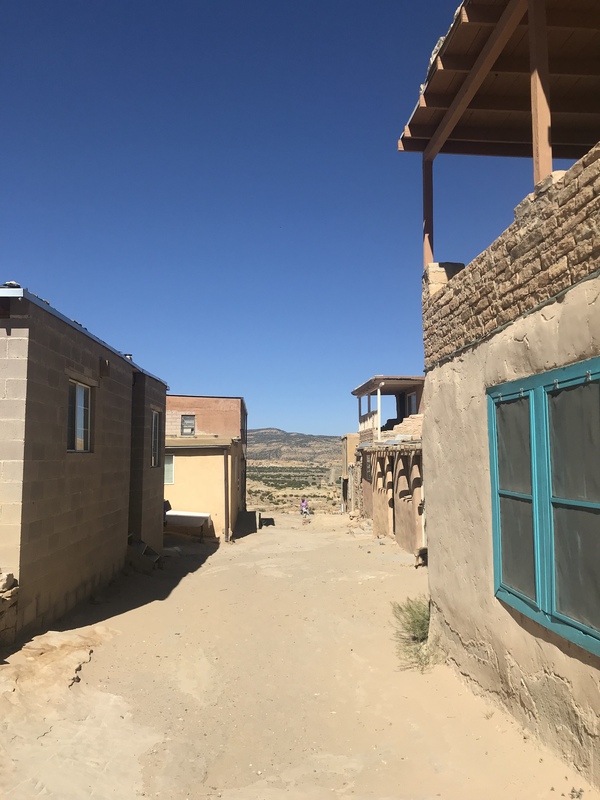 Santa Fe has also become a place where people want to be free to pursue their dreams without society getting in the way. Artists come from all around to be inspired by the environment and make a living off of that inspiration. 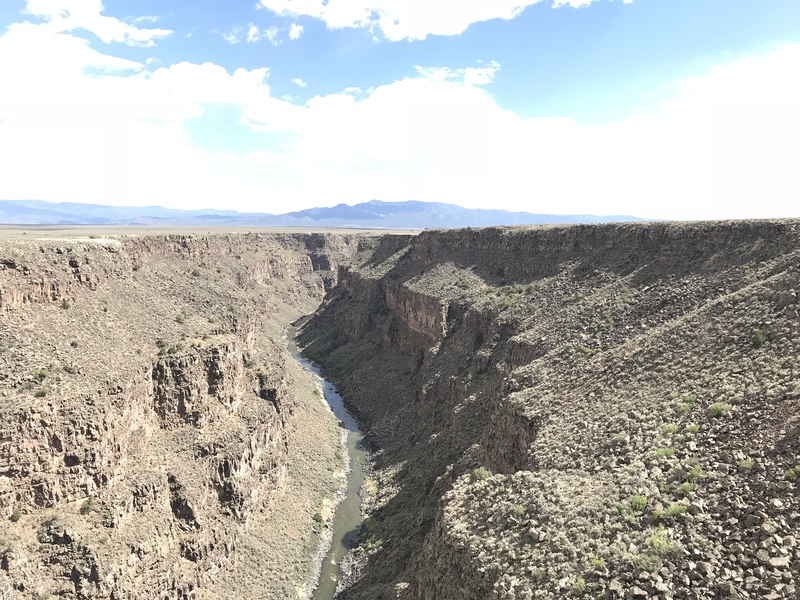 On Monday, we went to Taos and explored the town. 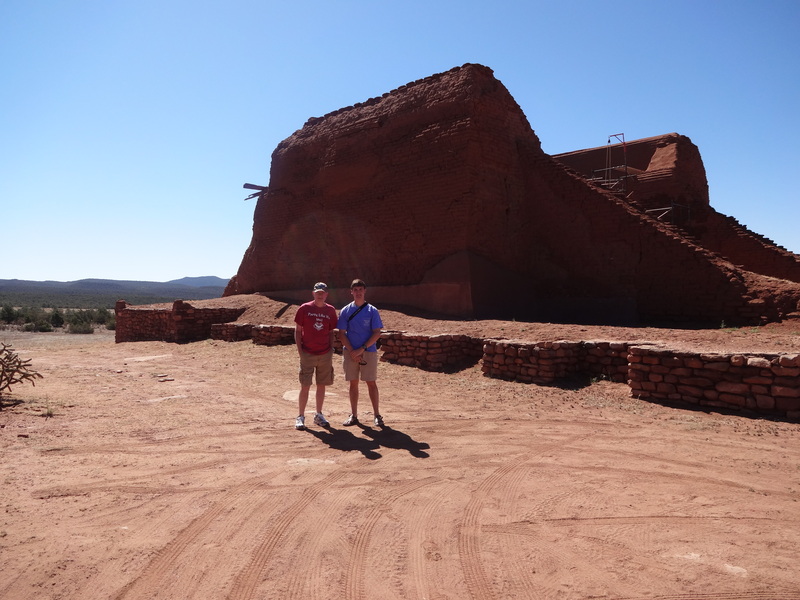 The stop that I had to make was at Kit Carson’s home. 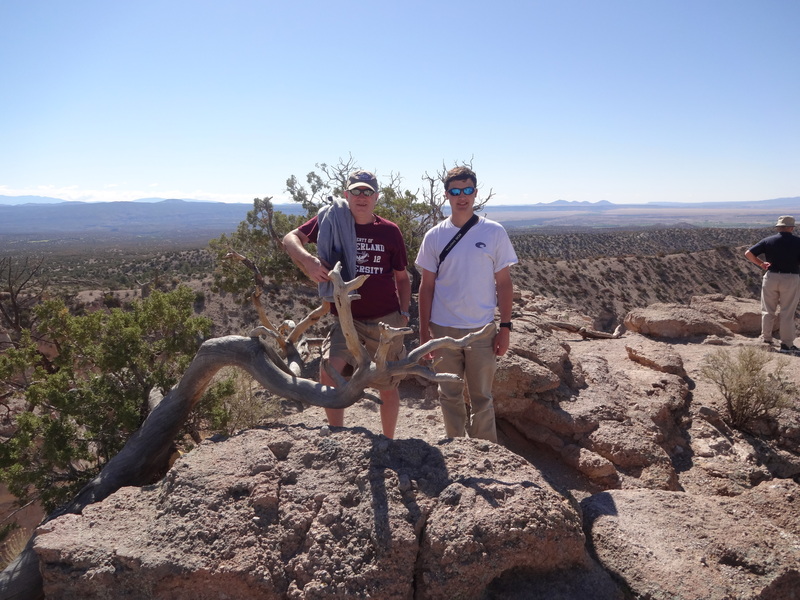 He is one of the great characters of the American West, and I wanted to walk in his footsteps. Before going into the house, we watched a movie about him, and one scene struck me to the core. The narrator said that Carson went into the West to escape American civilization and society. However, the trails he blazed would be used by others to bring that civilization and society into the West. In essence, he could not escape the bounds of his world because he brought them with him. That made me think of Cactus Slim and the citizens of Madrid. Like Carson, they moved there to be free of society and the stresses that go with it, but that same society followed them there. My wife and I brought it with us. The man in the blazer who my wife thought was Robert Redford’s brother brought it with him. The bikers at the next table brought it with them. Madrid is no longer an escape from the outside world. It is an attraction to the outside world. The same can be said of Santa Fe. It was a place for artists to live a life unnumbered. Now, it is a place of art galleries filled with expensive pieces. It is a place of nice hotels with spas and fancy restaurants. It is a place for people like us to walk around the streets and find our own sense of temporary freedom. The dreams of Kit Carson and Cactus Slim were to escape the world. Those dreams were shattered by the fact that it is an impossible feat. No matter where they go the rest of us are going to follow. There is one other sad part of those broken dreams. The people who went into the corners of the West to left one society and ran into another. 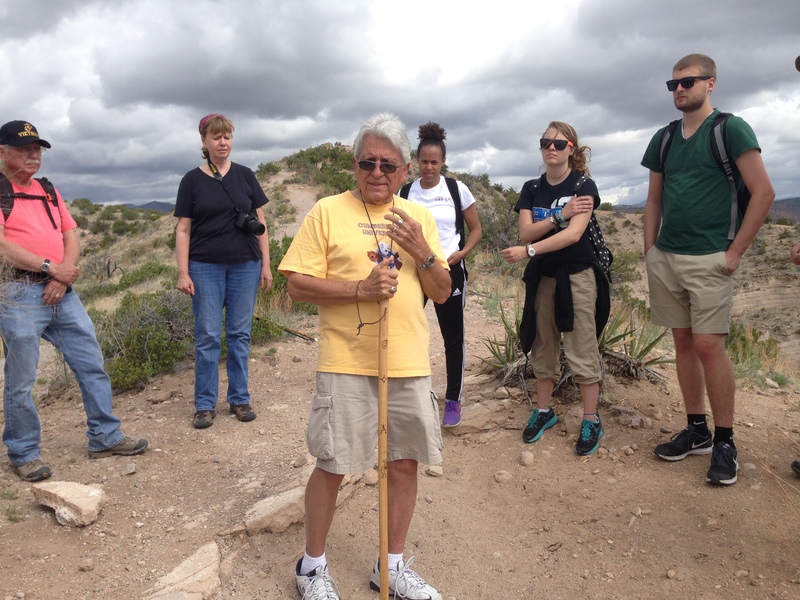 Madrid, Taos and Santa Fe sit on land that was once the domain of Native Americans. Now, those Native Americans are on reservations and come to those towns to sell their wares. The dreamers looked for freedom by taking that freedom from the people who were already there. Then, the freedom they thought they had achieved turned out to be temporary. Kit Carson and Cactus Slim come from different times, but their dreams turned out the same. When my nephew travels, he takes thousands of pictures. He takes pictures of everything imaginable, but he doesn’t take any pictures of himself. 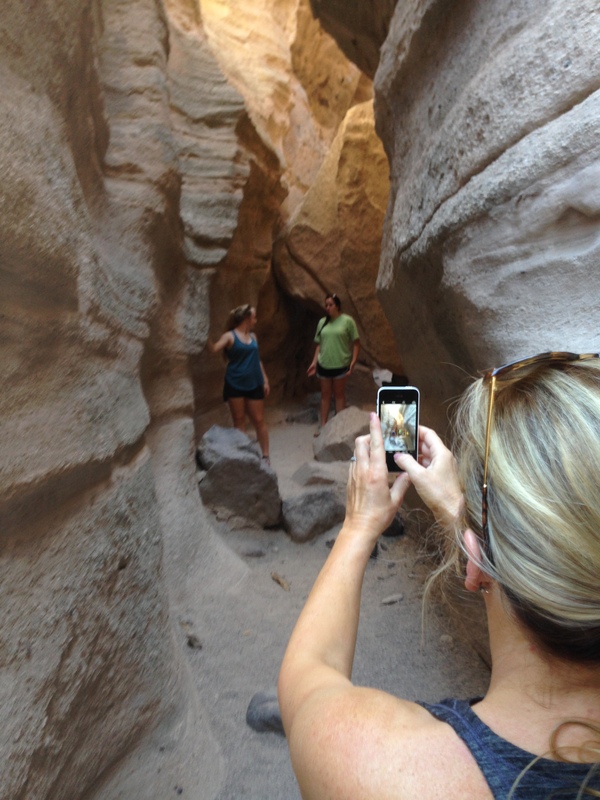 This drives my parents crazy because they think family vacations should have pictures of family. I understand this, but he doesn’t. Why does he want pictures of people that he sees all the time? He wants scenery and cool stuff. 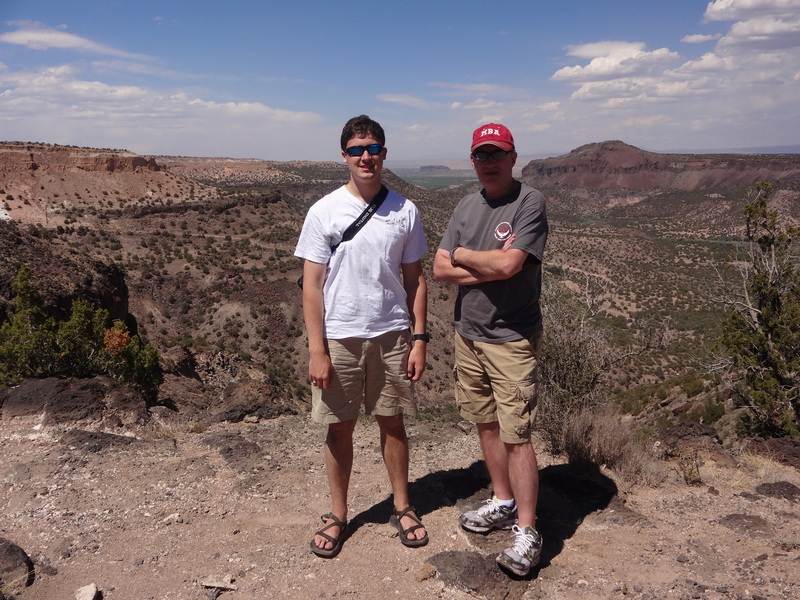 He went on the trip to New Mexico with me, and I promised them that I would get plenty of pictures of us both. He didn’t want to waste his camera space, so we used mine. These are some of the results. 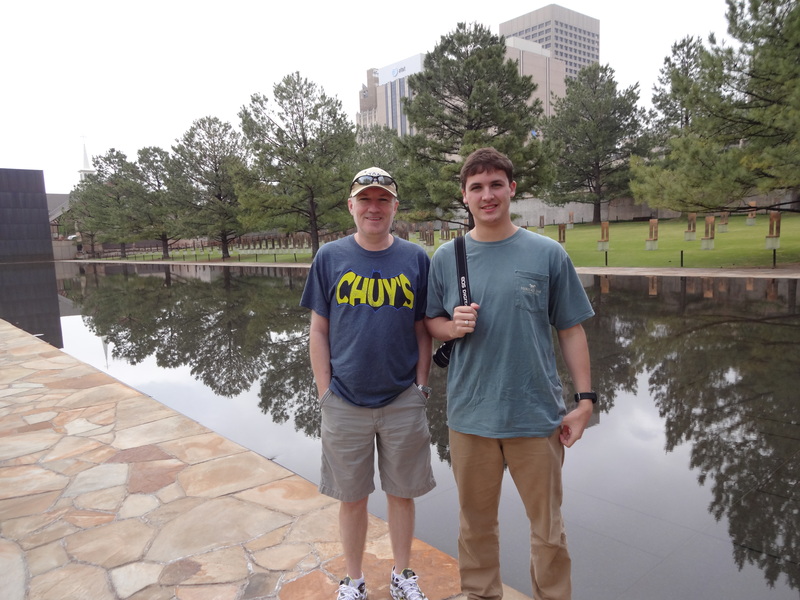 The first picture was taken at the Oklahoma City Bombing Memorial. It is a somber place, and I felt funny taking a touristy picture there. 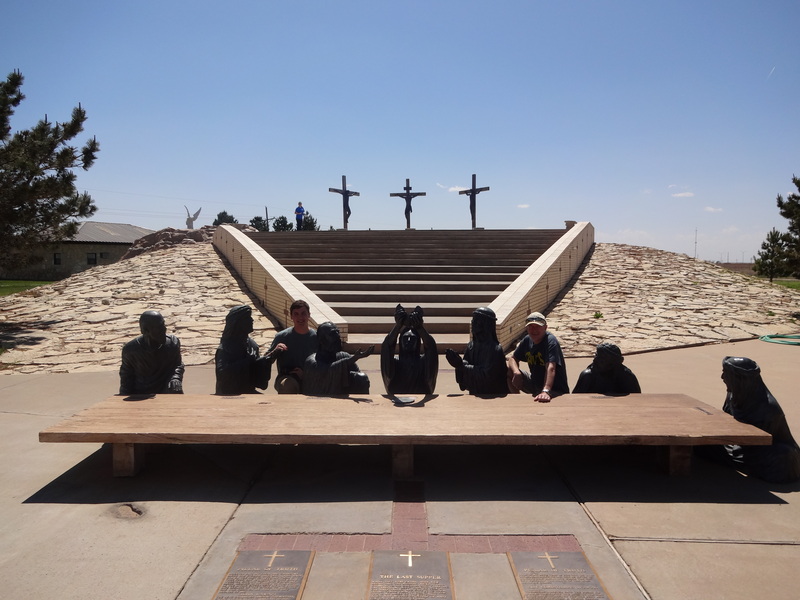 Next, we stopped at the big cross in Groom, Texas and sat in on a famous meal. 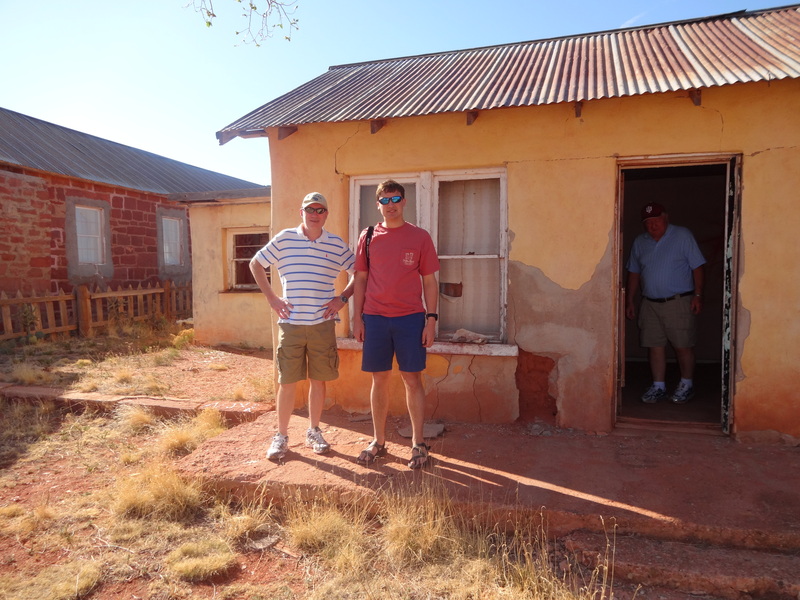 After spending the night in Tucumcari, New Mexico, we took a walk around the ghost town of Cuervo, New Mexico. That’s not Jose lurking in the shadows. It’s Trader Dave. 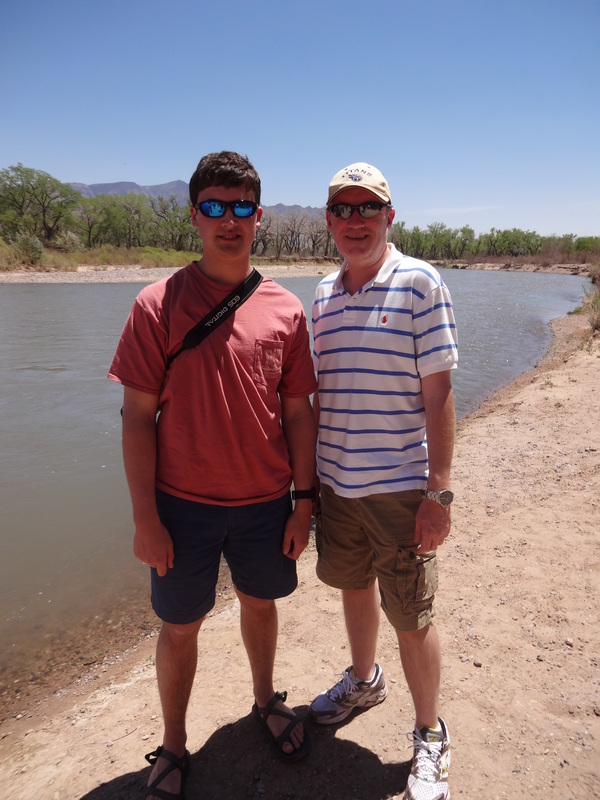 Later, we went to the shores of the Rio Grande at Coronado State Park. We didn’t cross the river. 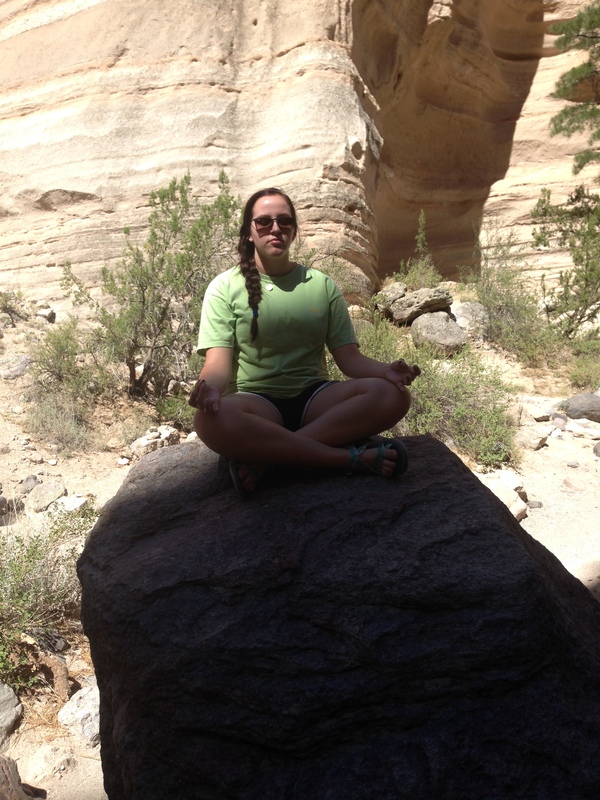 Instead, we climbed to Nambe Falls and found a big rock to sit on. 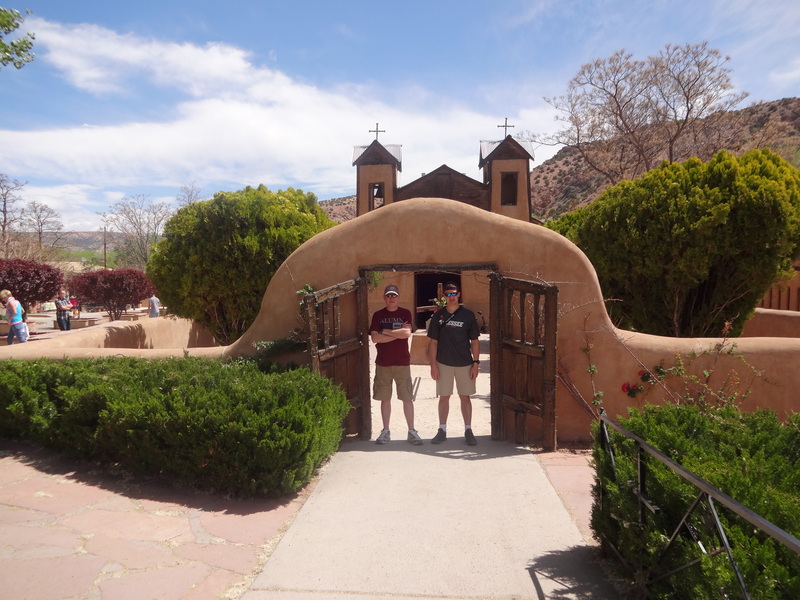 Then, we went to the church at Chimayo where there are stories of dirt that heals all wounds. The next day was rough for my nephew. 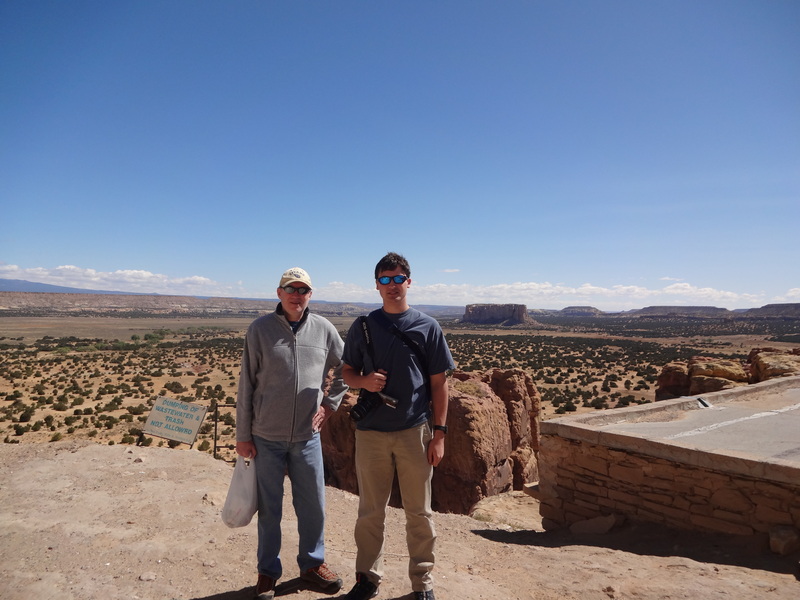 He was sick and had to stay behind as we went to Chaco Canyon. 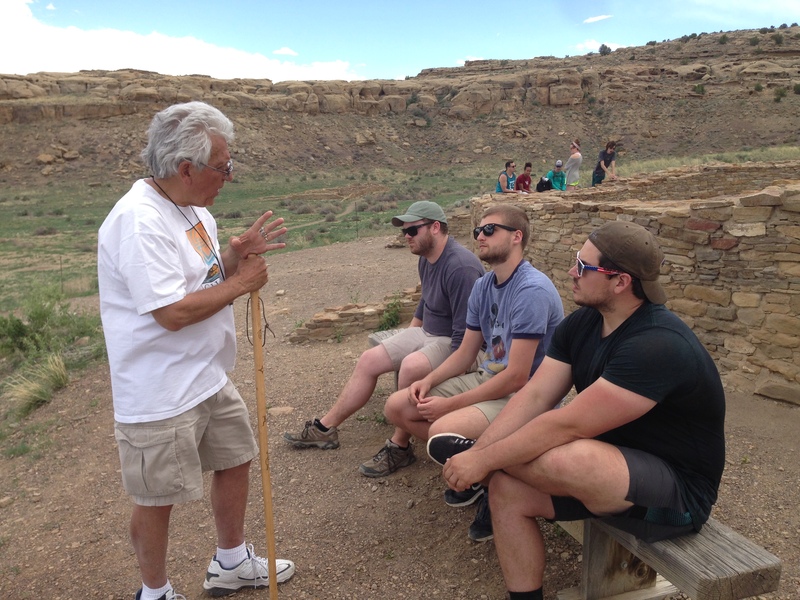 However, he bounced back and was able to visit Acoma. 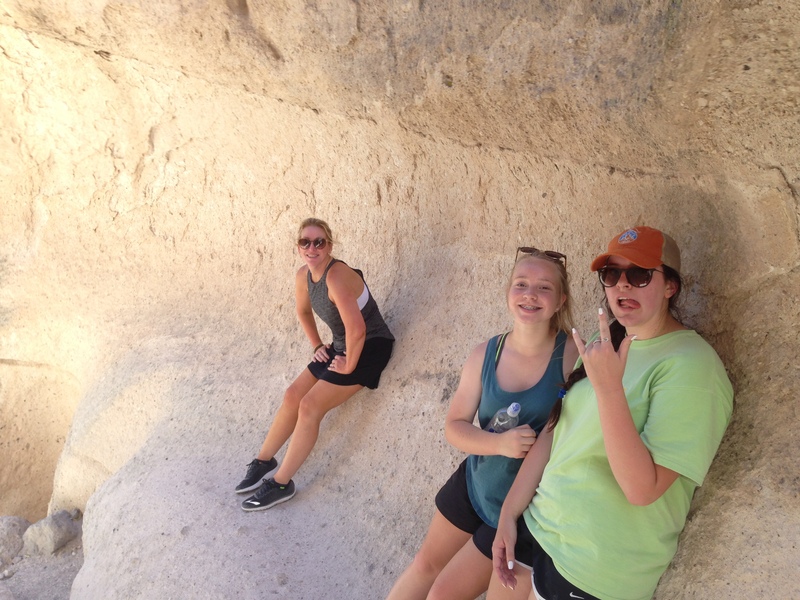 We took one picture in front of a kiva. 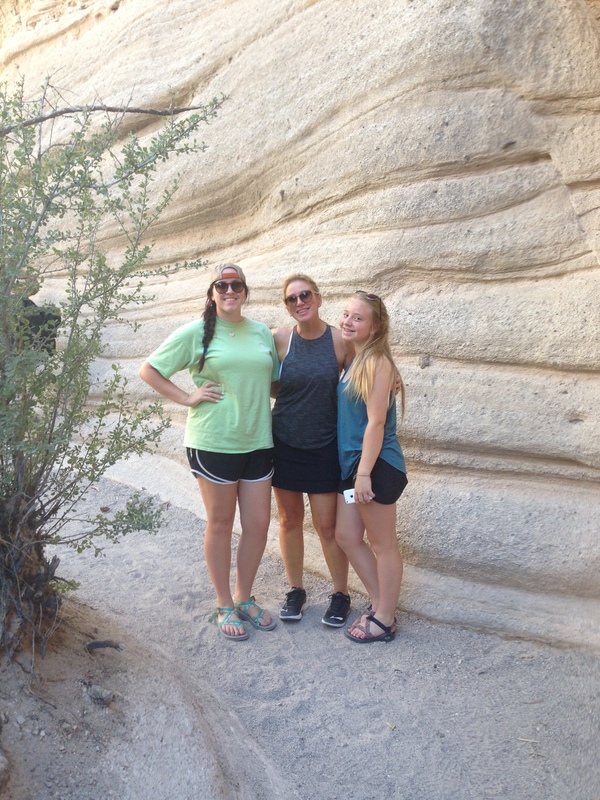 We took another picture with Enchanted Mesa behind us. According to the sign, I couldn’t throw my nephew over the edge. 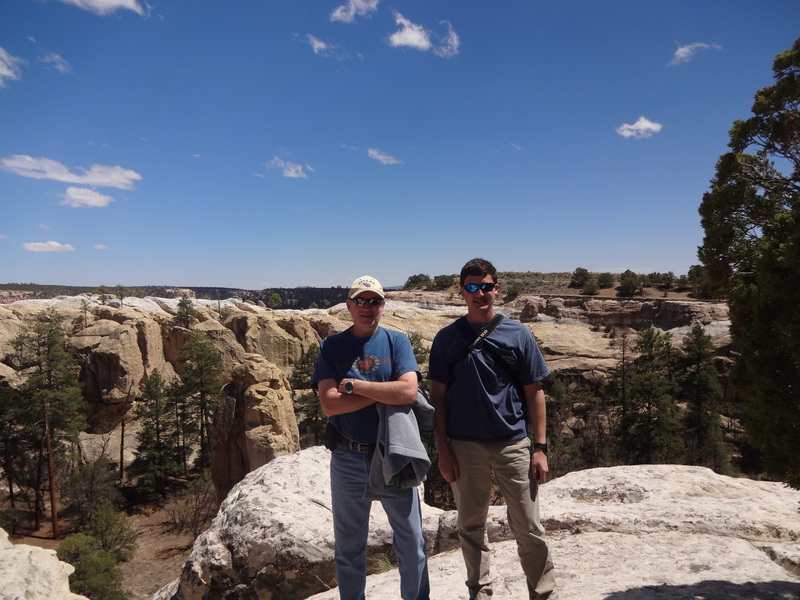 After Acoma, we drove west to El Morro and had our photo taken on top of that. I kept thinking that the box canyon below would be a great place for a hideout. 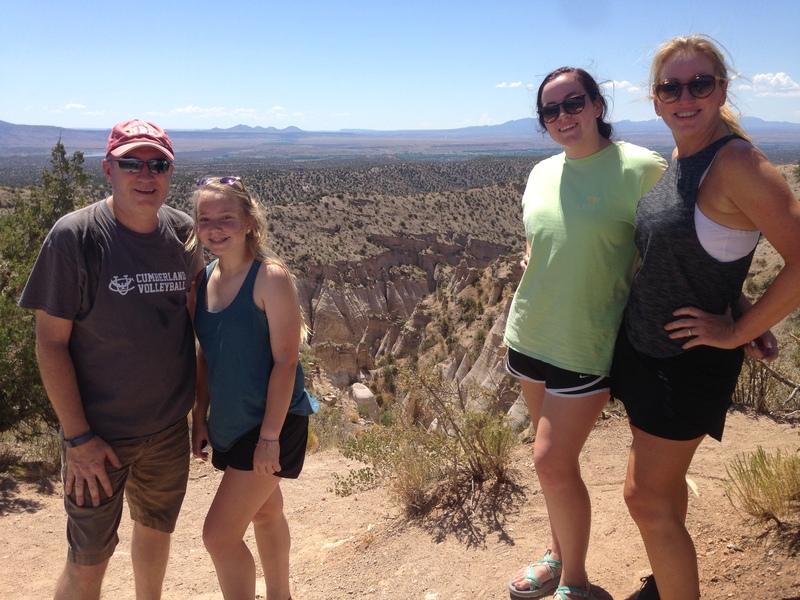 We hiked up the Tent Rocks trail and had another picture made. I’m not sure what the man in the background is doing. He has on a Skipper shirt and a Gilligan hat. That’s all I know. The next one did not involve a climb. 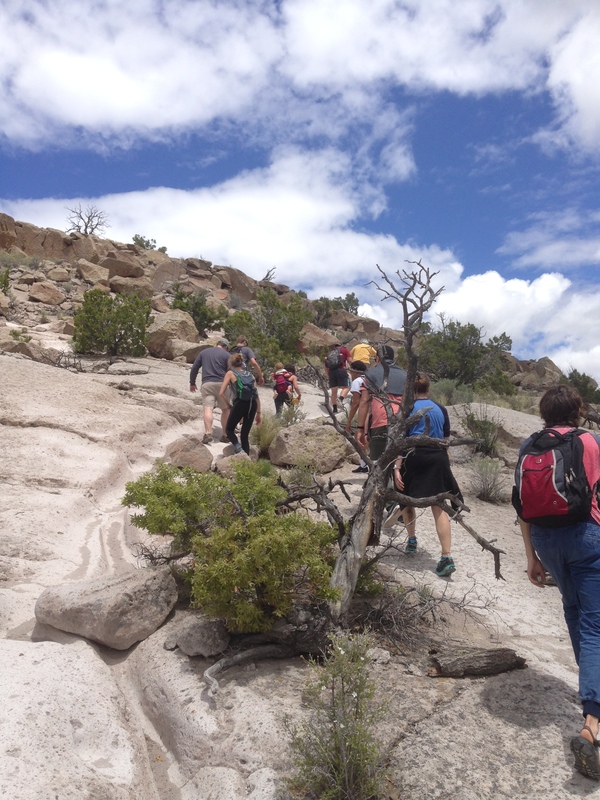 It involved making our way to the church ruins at Pecos National Monument. Finally, we drove to the overlook at White Rock. 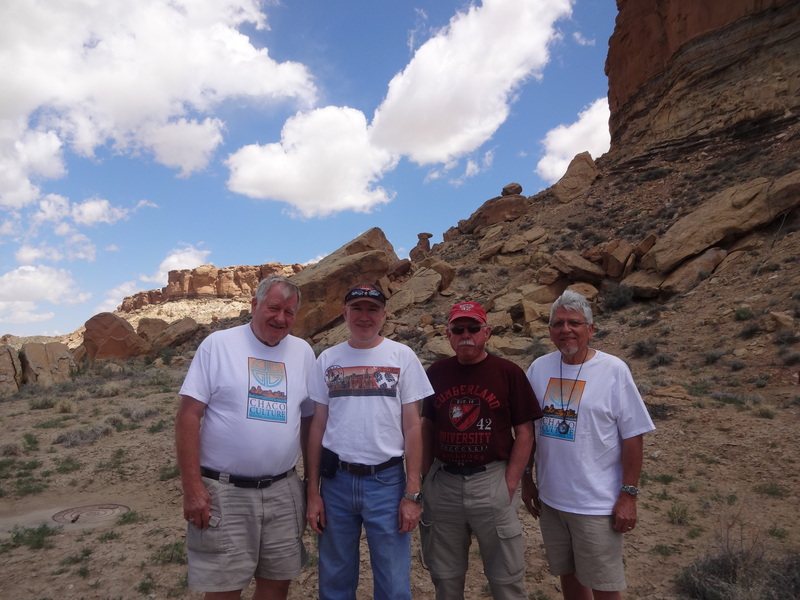 For several years, a band of outlaws has roamed the northern New Mexico territory. Their range has been from as far east as Tucumcari to as far west as El Morro. 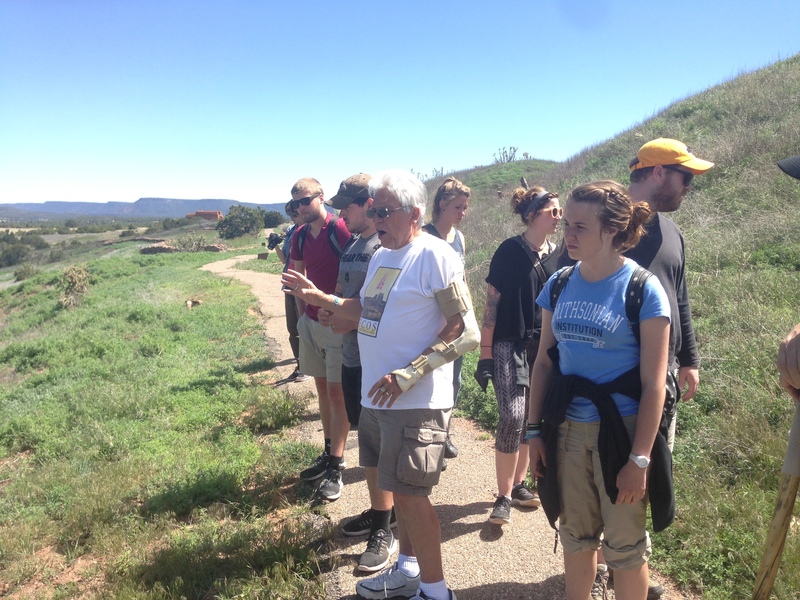 They have been south to Socorro and north to Ghost Ranch. These are hard men who hideout most of the year and do most of their riding in the spring. 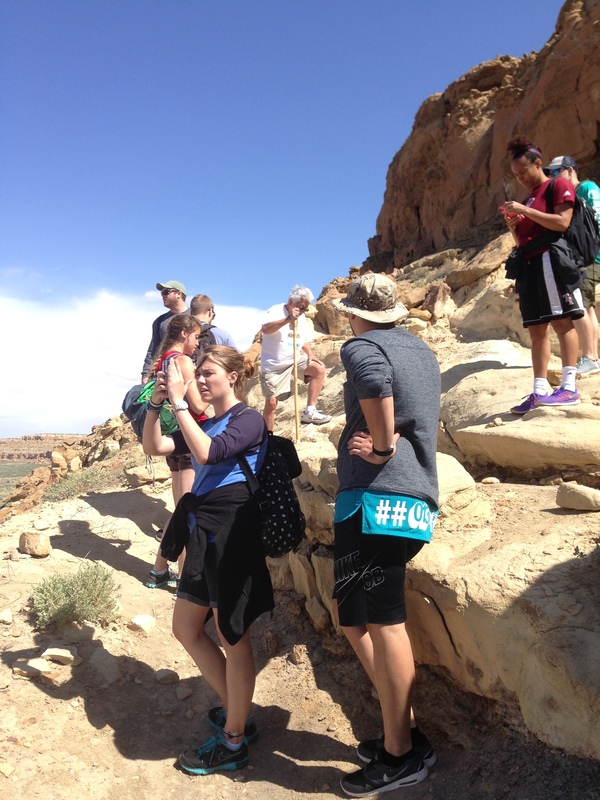 Undoubtedly, they are destined to find their way into the annals of New Mexico’s history. Shadow Horse – The leader of the gang. Some say he came from Louisiana, and others say he used to be a preacher. None of that is certain, but everyone knows that he is part Indian. He is most comfortable on the trails of the back country and moves like the wind over terrain that would kill most men. Tent Rocks is his favorite haunt. His native blood offers the gang safe entry into the surrounding pueblos and reservations. Without Shadow Horse, the gang would have never gained its notoriety. Doc Pete – Born near the goldfields of California, he has roamed from Canada to the former Confederacy and made a name for himself as a medicine man. The gang survives in the wild lands of New Mexico because of his knowledge of his surroundings. 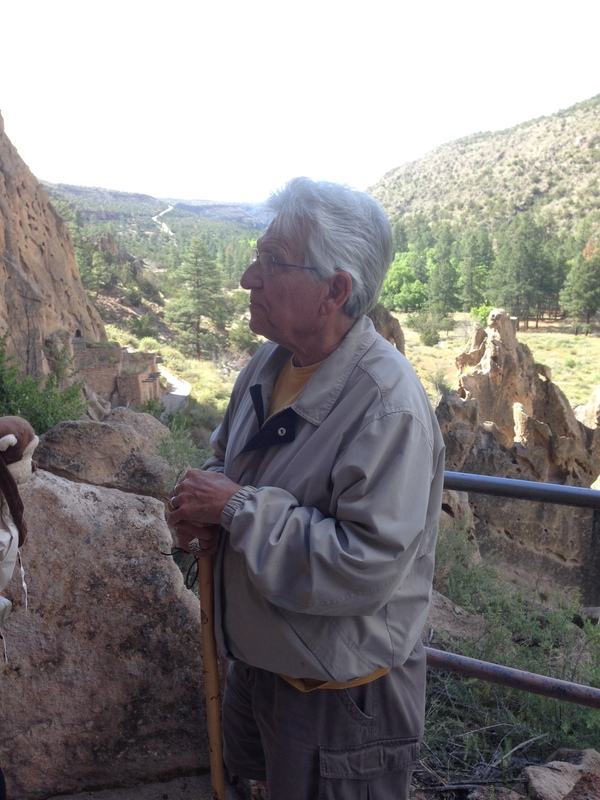 Once, he survived a near disastrous trek at Bandelier. He knows the plants that will kill and the plants that will heal. An expert on the trails, Doc Pete could disappear into the wilderness and never return. The Kid – As a wily old veteran, his name seems to be a mistake, but he is the youngest member of the gang. His career began in Tennessee at a young age, but, unlike the other famous Kid of outlawry, he had the luck and skill to stay alive. 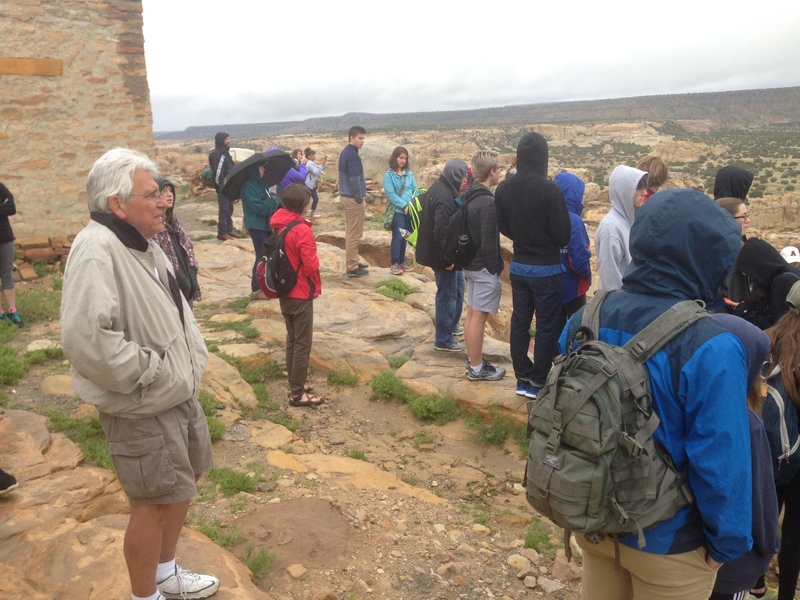 He is comfortable in the back country and serves as lookout when the gang is holed up in Chaco Canyon. Despite that, the Kid is happiest sitting at a Faro table with a saloon girl sitting on his lap. 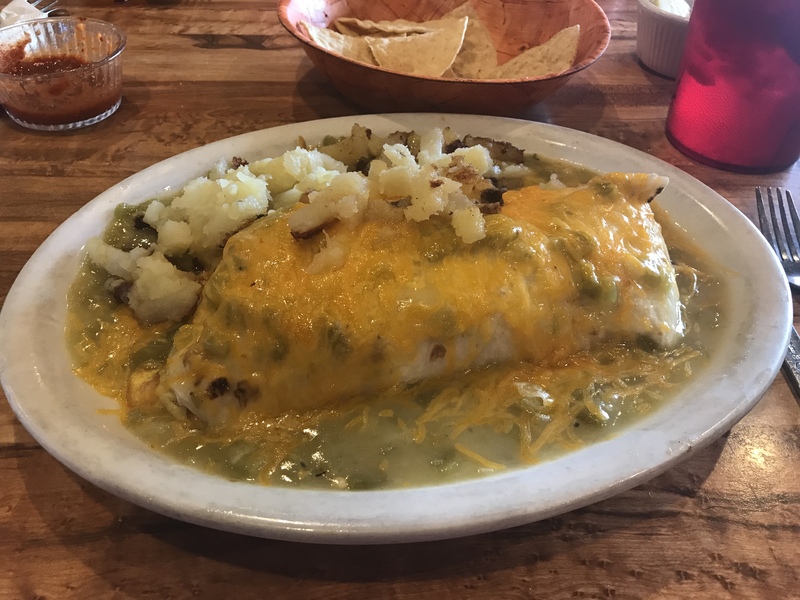 Trader Dave – Raised in the industrial region of northern Indiana, he followed the Santa Fe Trail into New Mexico. At times, he can be spotted around Pecos buying and selling goods with the local inhabitants. Dollars. Pesos. It doesn’t matter what currency. He can make a deal for any and all goods. Still effective on the trail with many years behind him, Trader Dave is at his best with frijoles and tortillas on a plate and whiskey in a glass.